Belgium - Popular husband-and-wife Country duo and reigning ACM Vocal Duo of the Year, Thompson Square, has spent this summer taking their Just Feels Good Tour across North America under a canopy of video screens and moving lights controlled by ArKaos MediaMaster Pro. The spectacular stage and lighting design was the brainchild of Jeff Lava of 44 Designs and lighting designer, Larry Foote. 44 Designs was introduced to MediaMaster Pro by A.C. Lighting, Inc. during a demo at 44 Design's Nashville office earlier this year. 44 Designs promptly selected MediaMaster Pro to control the intricate video system on their next project. 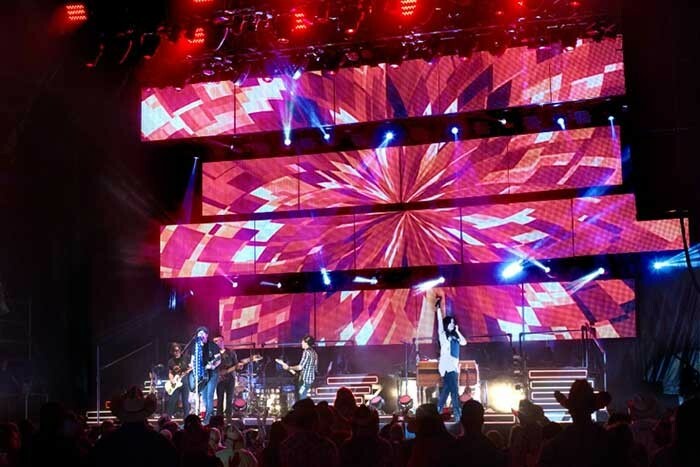 “For Thompson Square I wanted to create something that would introduce a modern architectural design into a conventional concert venue space and present the audience with something that would look good lit or unlit,” says Jeff Lava, founder of 44 Designs. 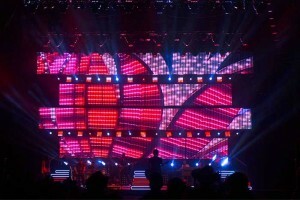 Lava instituted eighteen video panels composed of PixelFLEX Screens in metal frames which were rigged in four rows above the band and offset in depth and alignment. Massive visuals were played across these throughout the show to form the mainstay of the design. Key to the imposing visual aspect was the treatment of the video content which Lava and Foote agreed should be treated as a ‘separate piece of art’ for each song. 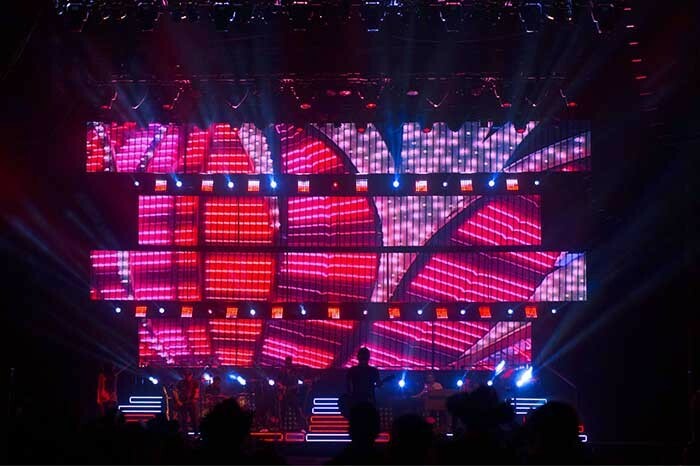 Behind the screens Foote installed a series of Krypton KR25 incandescent matrix fixtures, each of which uses 25 individually controllable PAR30 lamps, which he was able to pixel map with MediaMaster. “These were a really cool feature which I enjoyed playing with and really added to the show’s aptitude,” he says. Fourteen universes of DMX were in operation over all and, as all fixtures and video screens were running ArtNet, it was easy to hook everything up to the Jands Vista L5 console which controls the MediaMaster Pro. Foote was able to run video content and effects through the PixelFLEX Screens and the Krypton KR25 fixtures to create almost kaleidoscopic effects. “Once we had the basics in place it was fun to be able to play with the different layers and content on MediaMaster’s attributes and then to split up the images and direct them to different outputs. I changed the profiles in Vista to display separate outputs as groups so I could direct particular content to different KR25 units or video screens. My KR25s were on one group, my PixelFLEX had both separate outputs for each screen and another Master Output to control all the screens at the same time. Doing it this way, I was able to use each screen as its own fixture and was able to use it for more than just video. MediaMaster was not only instrumental in the creation and control of content in pre-production, but also proved invaluable on the road. “We knew we would be changing the rig a lot throughout the tour so didn't want to have to reprogram the rig at every venue,” explains Lava. “We therefore took the ‘alpha’ file of the designers’ work and have been able to fine tune it for each show, adapting different features to suit different setups. It adds a useful – and exciting - element of live mixing to the show.